Liquid ring vacuum pumps, for example, function by creating a ring of liquid around the vacuum pump’s enclosure which prevents evacuated atmosphere from re-entering the vacuum enclosure. Dry vacuum pumps, because they don’t require a steady level of liquid or lubrication, require much less maintenance than other vacuum pump models. Some of the liquids used in connection with vacuum pumps historically have posed health and environmental threats. Many vacuum pump oils produced before the 1980s contained polychlorinated biphenyls, which were later determined to be toxic, carcinogenic and an environmental pollutant. Though the use of this chemical in vacuum pumps has since become limited, dry vacuum pumps completely eliminate risks posed by lubricants or liquid sealants to their users and the environment. Dry vacuum pumps are often used in high tech processes. Pharmaceutical processing, laboratory vacuum degassing, drying, vacuum impregnation and filtration, evaporation and distillation all make use of vacuum pumps. Industrial processes like crystallization of certain materials, chemical processing, solvent recovery and vapor recovery are other settings in which dry vacuum pumps can be used. Because any pump that makes no use of liquid can be called a dry vacuum pump, the range of machines that fall into the category of dry vacuum pumps is quite wide. Small vacuum pumps, laboratory vacuum pumps, rotary vane vacuum pumps, high vacuum pumps and medical vacuum pumps can all be dry models, but some of them can make use of liquids. Every process that calls for the use of a dry vacuum pump requires a configuration that is appropriate for the task. A dry vacuum pump used to evacuate atmosphere from a lab will be different from a pump used to reclaim gasoline vapors at a fuel station. They will differ in size, the shape and configuration of their fans, the number of fans, the number of fan blades, the level of negative pressure that can be achieved in the vacuum enclosure and many other factors. What all of the varying dry vacuum pump configurations have in common is that they all work by removing atmosphere from an enclosure and preventing it from returning. Blades that spin around an enclosure create a small area of negative pressure, and atmosphere from within the enclosure rushes in to correct the imbalance. That atmosphere is forced out of an outlet, and more atmosphere from the enclosure rushes in to try to correct the imbalance. This cycle continues until the vacuum capacity of the pump is reached. Dry Vacuum Pumps Dry vacuum pumps are devices that create a vacuum without the use of liquids. 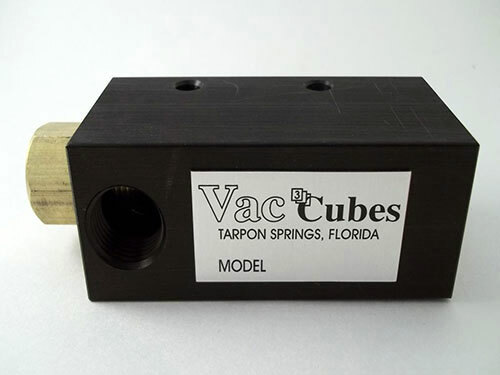 Many vacuum pumps require the use of oils for lubrication or other liquids to create an air-tight seal.